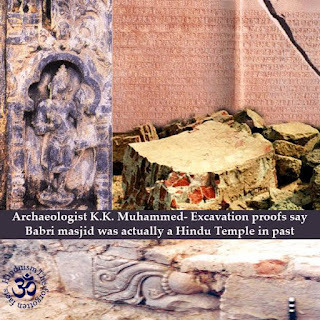 This shocking Truth is exposed by Dr KK Muhammed, former Regional Director of Archaeological Survey of India (ASI) that Babri Masjid was actually a Hindu Temple, which was demolished and then refurbished into a mosque during Mughal rule. He further adds that leftist historians of India like Romila Thapar, irfan habib, akhtar Ali, Bipin chandra, S gopal and many others gave False logics such as there were no historical accounts of demolition of Temple and Hindu/buddhist/ Jain cultural centres in and around Ayodhya before 19th century. While renowned historian MGS Narayanan fully agree with Muhammed, Left centric historians like Dr KN Panikkar dubbed the arguments raised by the author as baseless.